In Scrum, on each day of a sprint, the team holds a daily Scrum meeting called the "Daily Scrum.” Meetings are typically held in the same location and at the same time each day. Ideally, the Daily Scrum meeting is held in the morning as it helps to set the context for the coming day's work. These stand-up meetings are strictly time-boxed to 15 minutes. This keeps the discussion brisk but relevant. The Daily Scrum is the key inspect and adapt meeting during a Sprint. It is designed to quickly inform everyone of what's going on across the team. It's not a detailed status meeting. The Daily Scrum tries to improve communication amongst team members, identifies and removes impediments to development, highlight and promote quick decision-making, and improves the team’s participation levels. The responsibility for conducting the Daily Scrum is with the Scrum Team. The Scrum Master facilitates the meeting. He/she ensures that all impediments faced by the team are noted and should get resolved. Moreover, the SM also coaches the Team to keep the Daily Scrum short and making sure that people speak briefly. It is held each working day at the same time and at the same place. How is the meeting held? How much of work has been completed by him/her in the sprint? How much work is still remaining in the Sprint? Does anything impede progress? If so what it is? By focusing on what each person accomplished yesterday and will accomplish today, the team gains an excellent understanding of what work has been done and what work remains towards Sprint commitment. The Daily Scrum meeting is not a status update meeting in which a boss is collecting information about who is behind schedule. Rather, it is a meeting in which team members make commitments to each other. The Daily Scrum Meeting is held so the team can self-organize and achieve its sprint commitment. Team Sync : To review progress toward the Sprint goal. Assess Risks : To assess any risks to the Sprint commitment. Adjust Plan : To make any adjustments if required to the plan so the sprint commitment can be met. Accountability : The team should hold each other accountable for achieving their daily commitments. The team stays in sync with how the project is going. There is an opportunity for swift course correction if needed. By consistently committing and delivering, trust is built among team members. Action can be taken with those who are consistently unable to make their commitments (not always pleasant, but usually necessary). Time box your meeting duration : Without a specific time box in place, a Daily Scrum meeting can drag on and actually waste the time of the team. A typical daily meeting should get over in 15 minutes - but larger teams could agree upon a longer duration. The idea is to stop when that time runs out, and keep all discussions short and to the point. Start the meeting on time : Ensure that the Stand-up starts on time, even if some development team members are missing. A delay of even five minutes, when multiplied by the number of team members, counts for a lot of potential work wasted. Peer to peer interaction : All interactions should be on a peer-to-peer basis, and not in the form of a status report made to the Scrum Master. Teamwork is always emphasized in Scrum, and the team should communicate well with each other. Ask the 3 main questions and answer them : There are three questions that are sought to be asked and answered by each team member. What did you complete yesterday? What will you do today? Did you find any impediments in your way? Answers should be concise and precise. Stay focussed : The Scrum Master must keep the team focussed on answering the three main questions and prevent it from straying into random discussions. Each team member should focus upon the meeting and not get distracted by phone calls or emails. This can extend the time box, or worse, remove the focus of the team from the meeting. Don’t use it as a status reporting meeting : Apart from answering the three basic questions the meeting should not be used to discuss other topics or problems even if they’re identified as impediments by the team members. The main purpose of the stand-up meeting is to make the team conversant about the sprint current progress and set the focus upon what work’s going to be done on that day. Don’t micromanage the meeting : The product owner, scrum master or any other team member should not micromanage the meeting. The stand-up should not be used as a venue for issuing instructions to team members or deciding how the team should carry out its work. Scrum teams are empowered to decide on their own how work should be taken up and completed. No efforts should be made to monopolise or dominate the meeting. Don’t remain seated during the stand-up meeting : As the name suggests, the entire team should remain standing during the Stand-up. The idea is to keep the team members on their toes so the meeting does not exceed the time box and they get charged up for the day’s work. 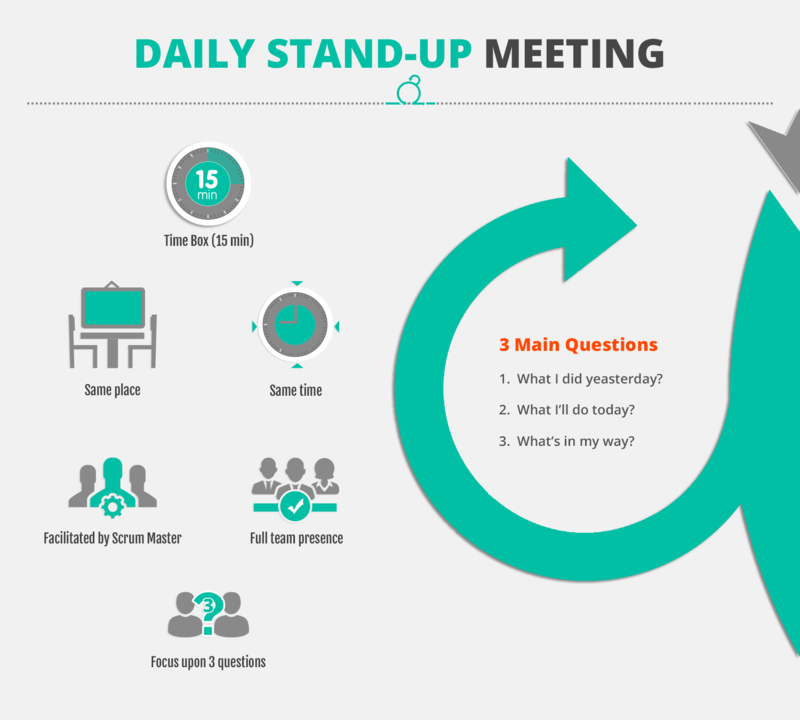 Don’t hold the stand-up meeting away from the work location : With the exception of remote or distributed teams, the daily stand-up should be ideally held on or near the work place or development room, preferably near the Scrum board. The idea is to keep the team charged up to tackle the day’s work and start with work immediately after the meeting. By holding the meeting away from the work place, the team could lose its focus by engaging in other discussions while reaching the work place.